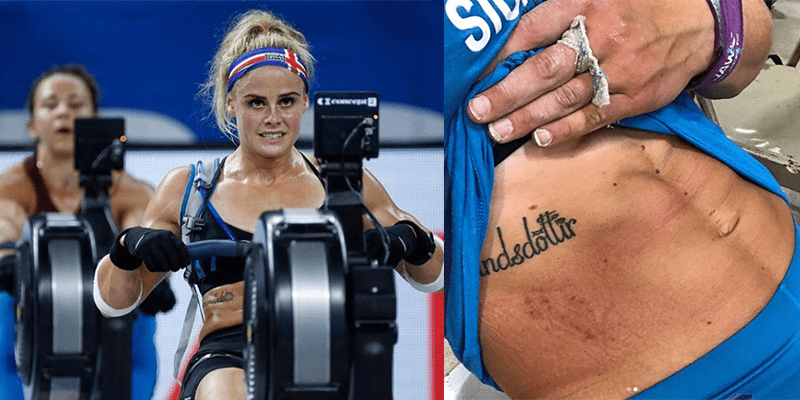 Find out what really happened to Sara Sigmundsdottir. Sara has had an unusual year. She injured her ribs and could not start exercising properly until March. She still neglected the CrossFit Games qualifiers, and so used the spring and summer for a lot of work. Her world-class practice camps were first in Denmark and then in Wisconsin, before Madison where the games take place. She has a very good team around her and when the games started on Wednesday she was in better shape than ever before. The injury occurred sometime on Wednesday. We do not know when and how. Whether it was in the heavy lifts during the Crossfit Total or in the Marathon is still a puzzle. Sara did not want to surrender, even though the pain in certain movements was considerable for her. She pushed herself through a whole race day on Friday and reached sixth place when she finished. Saturday was the same story. Sara put the pain aside and pushed through two more events, but in the heat of the last event of the day, it was clear that this could not last longer. Her mobility was quite limited, and the events ahead were such that she could have sustained permanent damage by perfoming them. There was only one decision that could be taken and that decision was taken in consultation with the coach and physician. Everyone who knows Sarah and knows what a contestant she is saw that she was not quite herself on the competition floor. The reason has finally been announced. The causes are rib bone fractures and something more related to the violation directly. These are not the same injuries she had before. Sara er búin að eiga óvenjulegt ár. Hún fór rifbeinsbrotin inn í það og gat ekki byrjað að æfa af almennilegum krafti fyrr en í mars. Hún negldi sér samt í gegnum undankeppnirnar fyrir Heimsleikana (The CrossFit Games) og nýtti svo vorið og sumarið gríðarlega vel í æfingar. Æfingabúðirnar hennar fyrir Heimsleikana voru fyrst í Danmörku og svo hér í Wisconsin stutt frá Madison þar sem leikarnir fara fram. Hún er með gríðarlega gott teymi í kringum sig og þegar leikarnir hófust á miðvikudaginn þá var hún í betra formi, meira stuði og tilbúnari í slaginn en nokkru sinni fyrr. Meiðslin áttu sér stað einhverntíman á miðvikudaginn. Við vitum ekki alveg hvenær og hvernig. Hvort þetta var í þungu lyftunum í Crossfit Total sem var þraut nr. 2 eða hvort þetta gerðist hreinlega í Maraþonróðrinum sem var þraut nr. 3, þar sem keppendur réru heilt maraþon (42 km) á róðrarvél. Sara var ekki á þeim buxunum að gefast upp þó svo að sársaukinn í ákveðnum hreyfingum væri að þvælast töluvert fyrir henni. Hún ýtti sér í gegnum heilan keppnisdag á föstudeginum og var komin í sjötta sæti þegar honum lauk. Í gær var sama sagan. Sara setti sársaukann til hliðar og ýtti sér í gegnum tvær þrautir til viðbótar, en í upphituninni fyrir síðustu þrautir dagsins þá var ljóst að þetta gæti ekki haldið lengur áfram svona. Hreyfigeta hennar var orðin ansi takmörkuð og þrautirnar sem framundan voru voru þess eðlis að hún hefði getað valdið sjálfri sér varanlegum skaða með því að láta á þær reyna. Það var bara ein ákvörðun sem hægt var að taka og sú ákvörðun var tekin í samráði við þjálfara og lækna. Allir sem þekkja til Söru og vita hverskyns keppniskona hún er sáu að hún var ekki alveg eins og hún á að sér að vera í keppninni. Ástæða þess hefur loksins verið kunngjörð. Meiðslin eru rifbeinsbrot og sitthvað fleira sem tengist brotinu beint. Þetta eru ekki sömu meiðsli og hún var með áður. Hún hefur að öllu leyti jafnað sig á þeim. Þessi meiðsi eru mun neðar. Sara á eftir að fara í ítarlegri læknisskoðun, en það er ekki ástæða til að áætla að það sé neinn varanlegur skaði.